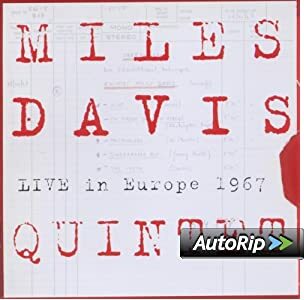 Just thought you all ought to know this: I was browsing Amazon's mp3 pages and on the Miles Davis Live in Europe Volume 1 page, there is currently a special offer--"Purhase the CD for $8.99 and get the complete album free on MP3. The cost of the MP3 download alone is $19.99. Too weird to believe, so I ordered it. Turns out, what you get is a cd of "The Best of..." & the complete download, not a best of download. This deal will probably not last long. Wow - awesome - thanks! I had already bought the best - of cd (for like $.99 during a mistake sale); just now checked my cloud player , and the whole box is there! Probably part of their new automatic ripping service? The CD the link on the MP3 page takes me to is the single disc Best of for $8.99, not the 3 disc set which is substantially more. But you got the 3 disc MP3 autorip? Well, yes, I did - took the leap of faith on that one and thank you very much. The translation from Cloud Player to Download Manager was a touch squirrelly but after double checking and making sure all 24 songs made it in there, it's A OK.